I have had my head down and have been working hard during the past few months, mainly on bookplate projects. However, there are some other things on my desk at the moment. More about them soon. Right now, I am preparing for three separate events that all take place during the next three weeks. I hope that you will be able to attend one of these; do please introduce yourself if you can. First is the FPBA Fine Press Fair at Brookes University, Oxford. This takes place on the weekend of 2nd-3rd November. Details of this event can be found here. Here is my table from 2011. As then, I will be selling a selection of hand made books and engravings. 2. Exhibition at Fulbrook House, Near Cambridge. I was very pleased to be invited to take part in a group exhibition at Fulbrook House Gallery, which is in Great Eversden CB23 1HN. I will be showing a group of framed engravings, together with some unframed. Details can be found here. This is my first year at this event. It was a huge success last year and I am looking forwards to taking part. I will joining a hundred other exhibitors and forty specialist food stalls. I will be taking engravings, books and cards. Details can be found here. The cathedral has been one of my favourite buildings since childhood and features in so much of my work. It will be a pleasure to show my engravings there. But first - back to the bookbinding! This is a new engraving but it has had a long gestation. On my daily walks I can look out across a meadow and see an old owl house. It is tilted at a strange angle and is falling apart but I rather like it. I have thought about making an engraving of it for years but I could never quite see it. Earlier this year I was leaning on a gate, looking at the same meadow when I saw a barn owl hunting. I love to watch this - the quiet beauty and power of these birds is wonderful. As the bird moved around the meadow, I could clearly see the old Owl house in the trees beyond the meadow and the view started to make sense as an image. Sometimes I just see something as an engraving. I worked from a very rough sketch - just enough to give me the composition. I decided to do the work from memory, based on careful observation of the view on my walks. The tree textures are very fine and wouldn't really become visible until the block was proofed. I gave my attention to the sky. I often feature a pair of birds; it is something of a signature of mine. 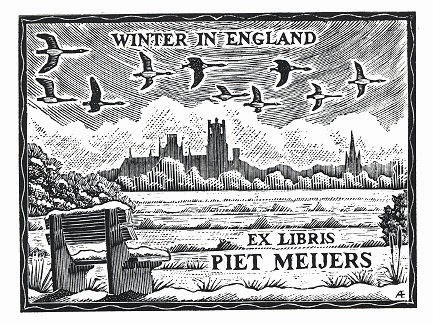 In this engraving, I decided to feature swallows as I usually see them flying over the same meadow at this time of year. Proofing went very smoothly and the image needed little adjustment. It was a pleasure to start the edition. 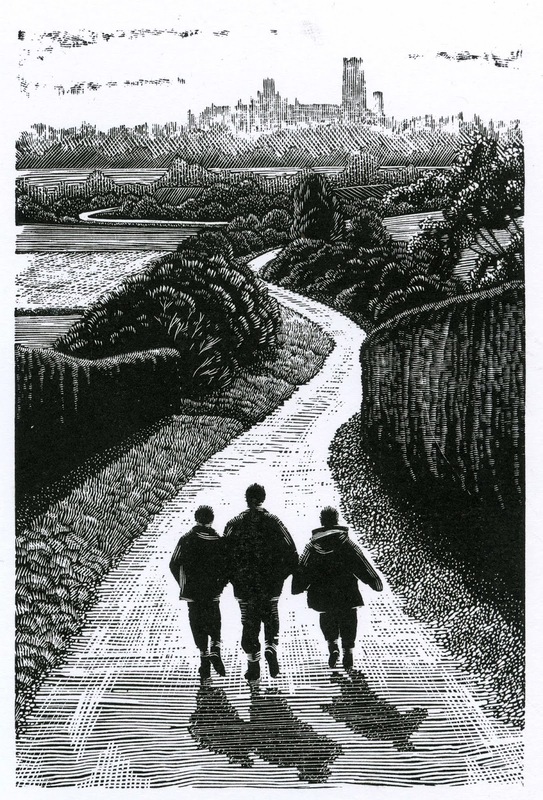 The finished engraving is very much what I had in mind when I first watched the owl hunting. It will be exhibited for the first time at Guildford and available from my Open Studio (see previous post for details). It can be purchased HERE at a pre-publication price for one week. This engraving has just been accepted for the 76th Society Of Wood Engraver's annual touring show. This starts at Art Jericho, Oxford (Private View at 5pm on Saturday, September 14th). I will have prints and books on display and on sale and it would be lovely to see you there. Location details can be found in the Open Studio Website - email me if you need any more information. I was very pleased to be invited to take part in Yvonne Arnaud Art 2013. I will be hanging a group of engravings and hope that some of you will be able to visit and see them, as well as work by the other artists. This takes place at The Mill Studio, Yvonne Arnaud Theatre, Guildford from Wednesday 10th to Thurs 25th July. Opening times are Mon - Sat 10 - 7:30 (Note: 15, 16, 22, 25 July 10 - 6). Admission is free. I have some invitations to the Private view on July 9th 6 - 8 pm. Email me if you would like one. Looking ahead, I will be returning to the Oxford Fine Press fair on the weekend of 2nd - 3rd November. More details follow but you can put these dates in your diary for a wonderful event!